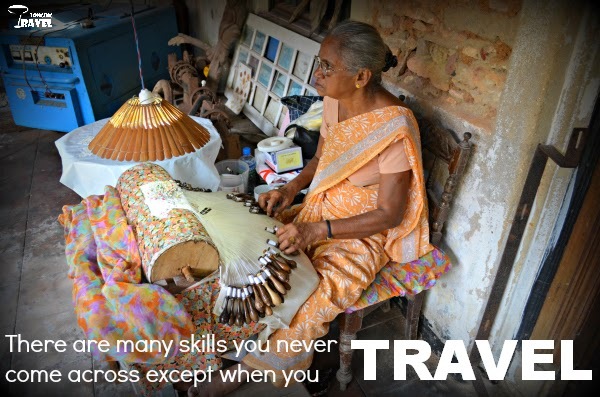 Travel Inspiration 18- Guess what she is making. We took this photograph while roaming in the Galle Fort, Srilanka. This is a free museum which displays personal collections of a Srilankan gentleman. The collection varies from china to clothes. When we came across this lady we could not understand what she was doing. It looked like some kind of weaving but I could not have understood what was actually being made. She is weaving Lace. If you have seen it being done similarly do share some of the pictures and if you do it how do you remember where to knot! There are so many skills and arts that are practiced around the world. You will never come across them if you do not travel. These may be far more interesting than the Mona Lisa.